Dublin march passes peacefully through city centre before breakaway group confronts gardaí outside the Dáil – away from the march route. TENS OF THOUSANDS OF PEOPLE have turned out for today’s austerity protests in Dublin. Crowds began gathering from 11.30am this morning and began making their way from Wood Quay to the GPO. The main event along O’Connell Street passed peacefully earlier today, but a breakaway group of protestors has arrived outside the Dáil, according to Storyful. Twitter users in the area are reporting that the some members of the group were throwing fireworks at gardaí, but gardaí in riot gear are dispersing the crowd there. A live web stream currently filming outside the Dáil shows groups of gardaí and protestors standing around, but no disorder. After the main march had moved onto O’Connell St earlier, ICTU’s David Begg and SIPTU’s Jack O’Connor were booed and jeered when they appeared on stage outside the GPO. Singer Christy Moore was greeted with huge cheers. After singing, Moore called out: “The system doesn’t work”. Speaking as the crowd arrived outside the GPO earlier today, Fintan O’Toole told RTÉ Radio One News he thought the weather had delayed people initially, but he expected a strong turnout throughout the day. By lunchtime, gardaí said they estimated that around 50,000 people were taking part in the march. Begg later told the crowd they had revised that estimate to 100,000. Speaking to the crowd at the close of today’s march, O’Toole thanked the thousands of people who turned out for the event and urged them to continue pushing against austerity measures. He said: “We have our dignity and we will be listened to”. 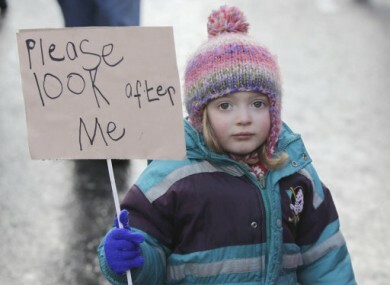 Email “In photos: austerity protest takes to the streets of Dublin ”. Feedback on “In photos: austerity protest takes to the streets of Dublin ”.